The winners of the Serra Club of Indianapolis’ annual vocations essay contest ordinarily write about the way in which priests, deacons, and religious brothers and sisters give of themselves in service to God and the Church. For decades, there have been six winners of the contest, one each from grades 7-12. Students in Catholic schools and religious education programs across the archdiocese participate in it annually. This year, however, there was a seventh winner. And the winning essay was not about clergy or religious. It was about a lay man who dedicated much of his adult life to promoting vocations to the priesthood and religious life. That man was John Kelley, who died of lung cancer in August 2009 at the age of 57, although he had never smoked during his entire life. Kelley was the quiet but strong force behind the Serra Club’s vocations essay contest for nearly 30 years. The young man who wrote the essay was Kevin Zander, a senior at Bishop Chatard High School in Indianapolis, who, along with his family, was a longtime friend of Kelley. Kevin was a three-time winner of the essay contest. He was especially pleased that the Serra Club of Indianapolis decided last fall to re-name it the John D. Kelley Serra Club Essay Contest. One of his parents, Jean Zander, knew Kelley before he married his wife, Lisa, in 1982. At that time, Jean saw how clearly Kelley knew what his own vocation was in life. It wasn’t long after meeting Lisa that John proposed to her. But before that happened, she made a trip from her home in Wisconsin to Indianapolis to visit her future husband. 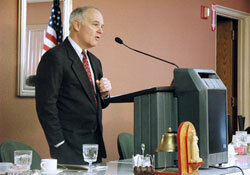 She soon learned how important the Serra Club and its mission was to John. “He said, ‘You’ve got to come to the priest’s dinner. I’m organizing [it]. We support them. We give them encouragement. They so deserve it. They so deserve to have our backing,’ ” Lisa said. “I came to it and he was just so excited about this event. Lisa was present for another meeting of the Serra Club earlier this year to hand out plaques to all of the winners of the essay contest named in honor of her late husband. The banquet took place on April 12 at the hall of the Knights of Columbus, Msgr. Downey Council #3660 in Indianapolis. In addition to helping youths across the archdiocese value the faith and priestly and religious vocations, John also did this for his own children, including his now 26-year-old son, Danny. Danny is a member of Immaculate Heart of Mary Parish in Indianapolis, the parish in which his parents raised him and his siblings. Although Kelley was strong in defending the faith and fervent in fostering vocations, he did these tasks quietly and humbly to such a degree that Lisa thinks he would be flabbergasted that the essay contest is now named after him. McClelland, a longtime member of Immaculate Heart of Mary Parish, knew John for more than 30 years. He now oversees the essay contest in his friend’s place. “It’s one thing that I can do for John that I know that he was passionate about,” McClelland said. Although a humble man, John wasn’t afraid to show his love for the faith and vocations to others, especially youths. According to Lisa, that strong faith never wavered after he was diagnosed with cancer in December 2008. Perhaps what John might be doing in heaven is praying for more lay people to promote vocations as he did.